The second version of Megapartnering in South Africa, my first one. Over a 1000 entrepreneurs came together while being trained and coached by JT Foxx and partners. Besides the enormous amount of top of the bill content we had the pleasure of meeting business people from all over the world. Networking was a big goal on this trip to South Africa. Also my very first time in the South. 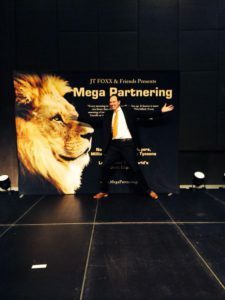 JT Foxx, the founder of Mega Partnering believes to be the next BIG market to watch is Africa and has dedicated his massive inluence and resources to making Mega Partnering Africa a huge success. I also met Steve Wozniak, Michael Irving, Edith Venter, Robert Gumede and Davynne Lidbetter.